If you have a task that will happen every couple of days or every month — any regular schedule, really — Project can help you create it as a recurring task, so you only have to set it up once. Note: If you have a repeating task that isn’t on a regular schedule, you need to create a separate task for each occurrence. 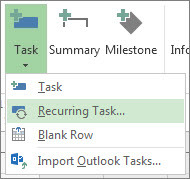 Click Task, click the bottom part of the Task button and then click Recurring Task. In the Task Name box, type the recurring task’s name. In the Duration box, add the duration of each occurrence of the task. You can fine-tune how often the task repeats in the area to the right of these options. For example, you can create a task that repeats every Tuesday and Thursday, or one that repeats every three weeks. Pick End after, and then type the number of times the task will repeat. Pick End by, and then enter the date you want the recurring task to end. Pick an item from the Calendar list, but only if you want the recurring task to have a different calendar than the rest of the project. For example, the recurring task could happen during the night shift, while the rest of the project happens during daytime business hours. Check Scheduling ignores resource calendars if you want Project to schedule the recurring task even if it does not happen when any resources are available to work on it. If you need a regular reminder instead of a full-blown repeating task, set the recurring task’s duration to zero. That is, make the recurring task a milestone. When you create a recurring task, Project automatically renumbers the task IDs and puts a recurring task indicator in the Indicators column. If you want to assign a resource to each instance of the recurring task, you only need to assign it to the summary recurring task. Project automatically assigns that resource to each instance. To learn more, see Assign resources to a task. Project gives recurring tasks the highest priority, which means it won’t split or delay them when it levels the resources assigned to them. Resource leveling is an advanced project management concept that involves spreading work evenly among the people working on the project. To learn more, see Level resource assignments.